Earlier in her life, Dolores Shoup didn’t have many opportunities to celebrate her birthday. But that changed when she moved to a group home for people with developmental disabilities in Taylorville 14 years ago. Since then, Dolores has enjoyed celebrating the occasion with her fellow residents and friends. “She loves being around people, and she loves life,” said direct service provider Sheila Peters, who is on staff at the Christian County Mental Health group home. As a patient with Memorial Home Services Hospice, Dolores had the opportunity to have a wish granted by the Sharing Wishes Fund. She knew exactly what she wanted: a party. The Sharing Wishes Fund was established in 2012 by the Memorial Medical Center Foundation to grant the wishes of Hospice patients and their families. Those wishes have included visits with relatives who live far away, favorite meals and hot air balloon rides. Dolores’ party marked the fund’s 300th wish. 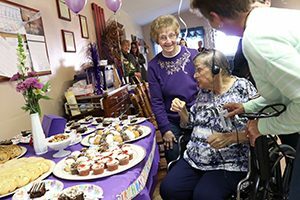 Staff and volunteers from Memorial Hospice threw her an early birthday party on March 22 with the help of staff and fellow residents from the group home. Although cancer has sapped much of Dolores’ energy, her excitement was undimmed. “I didn’t expect this many people,” she said, her eyes filling with tears, as she was wheeled into the living room under a canopy of lavender balloons. The cups, napkins, tablecloths and even the punch were all lavender, too—her favorite color. The timing of the party was a surprise; although she knew a celebration was in the works, she wasn’t let in on the secret until the previous evening. Organizers had hoped to host the event at the workshop where she and her fellow residents are employed, but Dolores’ condition made the group home a better venue. That didn’t quell her excitement as the countdown to the party began. “As tired as she was earlier, her eyes were bright as stars,” said Christian County Mental Health direct service provider Phyllis Westray, a longtime friend. Dolores loves painting, and often gives her artwork—which has won ribbons at the Christian County Fair—to her friends. Several of her pieces were on display at the party, including celebrity portraits and a painting on canvas of a waterfall in a peaceful landscape. About two dozen of Dolores’ co-workers and friends from church attended the party, with a few guests attired in lavender in her honor. Everyone had a story about how Dolores had touched their lives and brightened their days. Although her friends said it’s been difficult to see her health worsen, they were glad to celebrate the impact she’s had on their lives. “She just resonates love and joy,” Anderson said. Dolores Shoup passed away Saturday, March 24, only a few days after her party, at the age of 73. Learn more about the Sharing Wishes Fund, and help grant the wishes of Hospice patients like Dolores.